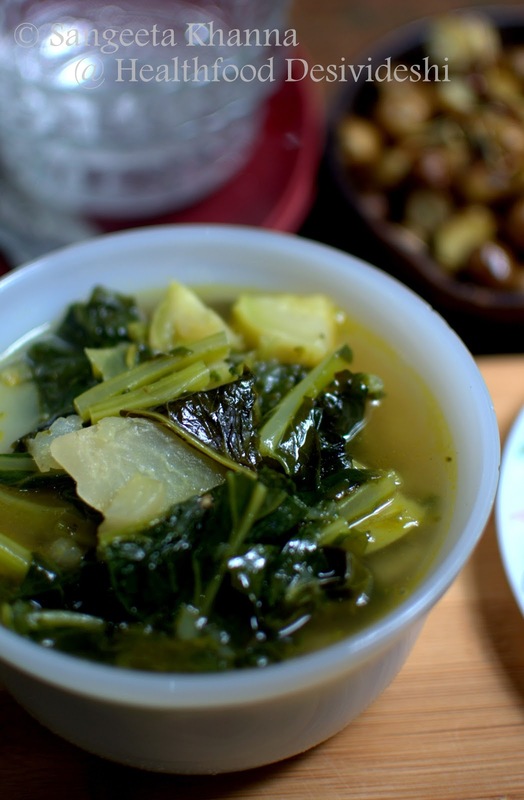 This would be my favorite comfort food as we had loved it as kids as well. Just the rosemary was missing from this dish as we had it only with the chilies, garlic and lots of black pepper. It was a snack, a side dish or a lunch box meal. We couldn't have enough of these pan roasted baby potatoes. Rosemary was known just as a medicinal herb then, useful for dandruff and scalp infections along with tea tree oil. I remember because I was working on herbs for some time. Most people did not know what herb it is as it was not available readily at grocery stores like it is now. But I am making most of this herb now. Tried growing it a few times, it thrives for one season and then dries up without any apparent reason. This time I have got some seeds and will sow them during summers as instructed. Wish me luck my friends. With potatoes, garlic and some dry red chilies, rosemary is insanely yummy and aromatic as well. You feel like eating them out of the pan when they are roasting. The good thing is, it doesn't take much time to cook. Here is how I make it. No measurements, just go the way you are feeling that day. Less garlic , more rosemary, lots of crushed peppercorns, loads of rosemary add everything the way you like it, the way you are feeling that particular day. Boil about a pound of baby potatoes, or more if you think you are going to have it for a meal. Keep the skin on but don't forget to clean them well with a soft brush. It might feel cumbersome but when you have placed the colander under running water, just go on brushing them gently and remove any blotchy skin if required. Boil them up to 3/4 done. Strain them and keep aside. Do not microwave them as it makes the potatoes dehydrate a little which is not suitable for this roasted recipe. Otherwise I prefer the microwave for boiling potatoes for any other purpose. Cool the potatoes well and then halve them. Heat oil (olive oil or cold pressed sunflower oil) in a thick base iron kadhai or a cast iron pan or kadhai, and throw in a few broken dry red chilies. Let them get heated and add the potatoes and garlic with peels at once. Sprinkle rock salt or coarse sea salt and keep stirring after every 30 seconds, keeping the flame medium high. 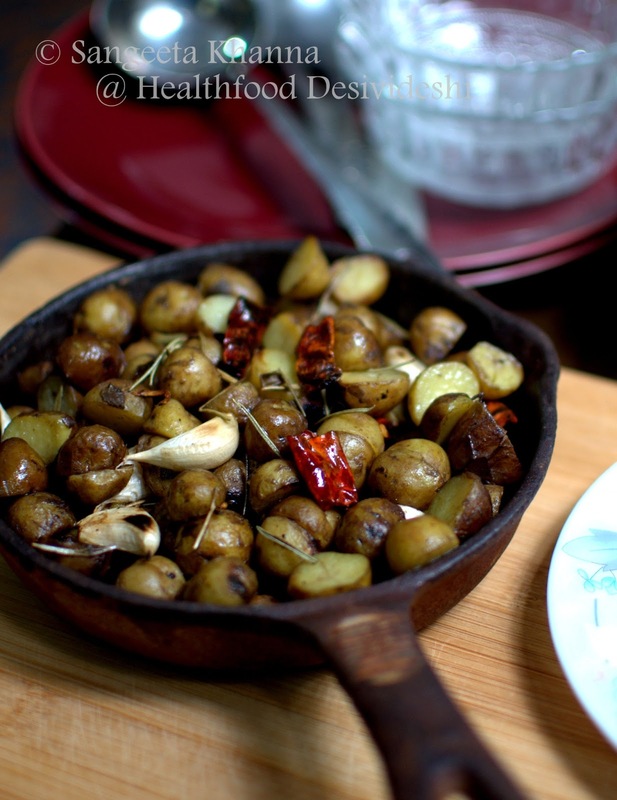 So all you need is a pound of baby potatoes, 2-3 tbsp of olive or cold pressed sunflower oil, lots of garlic pods unpeeled, dry chilies to taste, lots of freshly milled black peppercorns and rosemary. Add salt to taste, better to use coarse sea salt. Wait till the potatoes start browning and the garlic also start getting soft and spotted. Sprinkle rosemary generously and freshly milled black peppercorns too. Keep stirring for about 3 minutes more so the rosemary gets absorbed into the potatoes. The cooked garlic pods will be fun to slip out of their skins and gobble them up. Potatoes will be had with the skin on. You get extra points for eating potatoes that way. If you want your hands free while this baby potatoes dish cooks and absorbs rosemary flavors, just mix everything up and bake on a wide tray for 15-20 minutes at 200 C.
We had it along with this Knol khol curry made the Kashmiri way, they call it Monji Haak. This knol khol was from the garden, very tender and full of taste. To make this soupy curry you just need to heat about 2 tbsp of mustard oil, sprinkle some asafoetida (dry or dissolved with water) and add all the (about 500 gm) knol khol chopped roughly along with the leaves. Toss a few times till some of the pieces start getting browned, add salt and 2-3 broken green chilies, add about 2 cups of water as well and cook covered for about 15 minutes. Simmering for a little more can be good if you want the vegetables really soft. 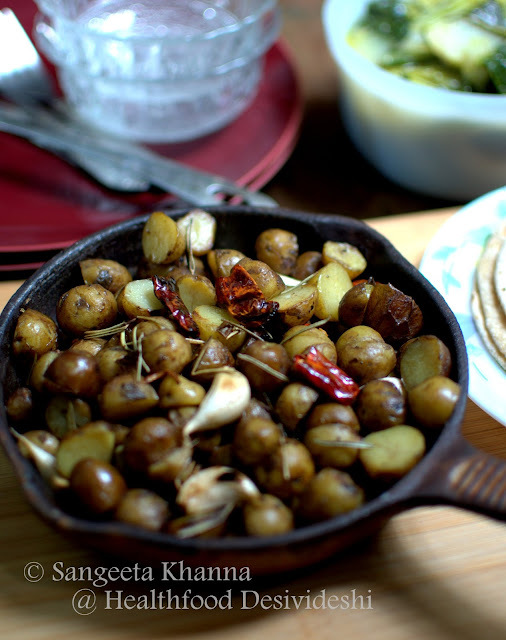 Check out this Monji haak recipe and how it tastes great with plain boiled rice.. 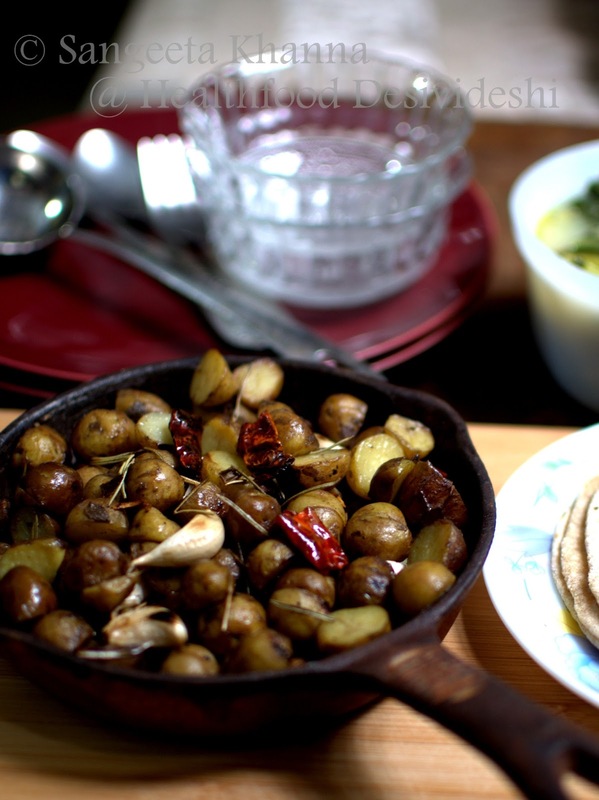 This recipe can be cooked with Turnips as well, or a combination of Turnips or Knol khol and lotus stem, like this Gogji nadir cooked Kashmiri way. We also had some besan ki roti with this meal. A heavy meal that doesn't make you feel heavy after enjoying it heartily. I bet that it taste great and the colour is also nice. I love roasted baby potatos. but I don't think that I have ever had them with garlic pods. This should be a good Idea. What is the Hindi name for rosemary? ha ha..there wont be a hindi name for Rosemary Amrita....it is not an Indian herb but everyone knows it by the name of Rosemary.